CPO 3rd month Mac futures contract traded RM5 points higher as compare to previous trading sessions to close at RM2595 with a total of 4,265 lots traded in the market. CPO price traded sideways during trading sessions as contradicting lead from soybean oil and crud oil trading direction were not compliment with each other. CPO price seems tested support levels at RM2582 twice but failed to penetrate successfully below the support levels; hence, CPO price was trade sideways within range from RM2582 to RM2600 regions. Technically, CPO price seems resisted to rebound higher above 50% Fibonacci resistance levels at RM2607 regions range from RM2632 to RM2582. CPO price would seen remain in correction phase provided resistance levels at RM2610 and RM2632 were not violated during trading sessions. Support levels were seen at RM 2557 and RM2481 regions. FKLI Dec Futures contract traded 8 point lower to close at 1270 levels as compare to previous trading session to with a total of 4,190 lots traded in the market. FKLI closed lowest of the day after 2 times traded lower during trading sessions which mostly directly influence by regional indices and Dow Jones electronic trading. FKLI attempted to challenge nearest support at 1270 regions after fail to hold above resistance levels at 1278.5 regions during trading sessions. Technically, FKLI seems traded in critical price zone as support levels at 1269.5 and 1256 was seen vital support in order FKLI to remain intact with bull rally based on the observation on the hourly price chart. However, previous high level at 1279.5 shall be count as rebound wave provided support levels were violated and FKLI would highly possible to trade in bear trend in the medium term. 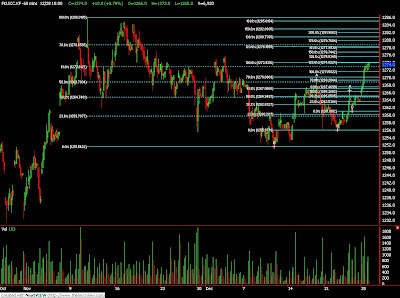 Resistance levels were seen at 1274 and 1278.5 regions. Dec. 29 (Bloomberg) -- Crude oil was little changed at a five-week high as heating oil climbed on U.S. forecasts for cold weather and the dollar strengthened against the euro. Oil increased for a fifth day as heating oil rose to a two- month high on the outlook for below-normal temperatures for much of the nation next week. Reports signaling that the U.S. economy may be rebounding from the worst recession since World War II bolstered the dollar, curbing the appeal of commodities. Crude oil for February delivery rose 10 cents to $78.87 a barrel on the New York Mercantile Exchange, the highest settlement price since Nov. 18. Prices were little changed from the settlement after the American Petroleum Institute reported at 4:30 p.m. that U.S. crude-oil stockpiles increased 1.73 million barrels to 330.5 million. February oil fell 1 cent to $78.76 a barrel in electronic trading at 4:39 p.m. Heating demand is expected to be above normal in the Northeast, Southeast and central U.S. for most of the week through Jan. 5, David Salmon, a forecaster at Weather Derivatives in Belton, Missouri, said in a report today. A “major arctic wave” heading for the U.S. will likely cause millions of households to boost heating fuel use this winter, according to a report by State College, Pennsylvania- based AccuWeather.com. A pattern forecast to linger until February will cause highs in the 20s Fahrenheit (minus 7 to minus 2 Celsius) in northeastern cities, AccuWeather said. Heating oil for January delivery rose 2.93 cents, or 1.4 percent, to settle at $2.1028 a barrel on the Nymex, the highest level since Oct. 21. It has gained 8.1 percent in the past five trading days. The dollar gained 0.2 percent against the euro to $1.4344 at 2:54 p.m. in New York from $1.4378 yesterday. Earlier, it touched $1.4332. Confidence among U.S. consumers rose for a second month in December as pessimism over the outlook for jobs diminished, according to the Conference Board, a New York-based research group. Its confidence index increased to 52.9, in line with the median forecast of economists surveyed by Bloomberg, from 50.6 in November. The S&P/Case-Shiller home-price index, a measure of home values in 20 U.S. cities, increased 0.4 percent in October from the previous month on a seasonally adjusted basis. It has risen every month since June. “It’s a sign that the bottom has been met and the worst is over,” said Brad Samples, a commodity analyst for Summit Energy Inc. in Louisville, Kentucky. Oil prices climbed as much as 0.8 percent earlier today on the economic news. The Reuters/Jefferies CRB Index of 19 commodities fell 0.2 percent to 283.9. It was the first decline since Dec. 21. Oil prices have tripled in the past decade. They’re up 77 percent this year and poised for the best annual performance since 1999 as the accelerating economy raises demand. The International Energy Agency increased its forecast for 2010 global oil use to 86.3 million barrels a day on Dec. 11, 130,000 barrels more than its previous estimate. Oil retreated from the day’s high after failing to break through technical resistance at about $80 a barrel, said John Kilduff, a partner at Round Earth Capital, a New York-based hedge fund that focuses on food and energy-commodity investments. Brent crude for February settlement increased 32 cents, or 0.4 percent, to $77.64 a barrel on London’s ICE Futures Europe exchange. Earlier today, oil prices declined as Russia reached an agreement with Ukraine on oil exports to Europe, allaying concern of a supply disruption. Russia agreed to pay 30 percent more to transport oil to Europe via Ukraine next year, according to Ukrainian state energy company NAK Naftogaz Ukrainy. U.S. inventories of distillate fuel, including heating oil and diesel, probably dropped 2.23 million barrels last week from a five-month low of 161.3 million, according to the median of 14 estimates by analysts in a Bloomberg News survey before an Energy Department report tomorrow. Thirteen respondents forecast a decrease and one said there was a gain. U.S. oil inventories probably fell 1.85 million barrels in the week ended Dec. 25 from 327.5 million the prior week, according to the survey. Twelve respondents forecast a decline and two said there was an increase. Oil volume in electronic trading on the Nymex was 207,018 contracts as of 2:45 p.m. in New York. Volume totaled 202,088 contracts yesterday, 65 percent below the average of the past three months. Open interest was 1.2 million contracts. Dec. 29 (Bloomberg) -- Gold prices fell, ending a three- session rally, on speculation that gains by the dollar will curb demand for the metal as a hedge against weakness in the currency. The greenback climbed to a two-month high against the yen after reports showed confidence among U.S. consumers increased in December for a second month, and home prices in 20 major U.S. cities rose in October, the fifth straight gain. Gold futures reached a record $1,227.50 an ounce on Dec. 3 as the dollar traded at a 15-month low against a basket of six currencies. Gold futures for February delivery fell $9.80, or 0.9 percent, to $1,098.10 an ounce on the New York Mercantile Exchange’s Comex unit. The most-active contract rose 2 percent in the previous three sessions. In London, bullion for immediate delivery slipped $9.03, or 0.8 percent, to $1,098.27 an ounce at 7:26 p.m. local time. Some investors also sold the metal to capture gains for the year, analysts said. Gold, up 24 percent in 2009, is headed for the first monthly decline since August. “Investors have been booking profits on gold this whole month,” McNeill said. Bullion has almost quadrupled in this decade, rising from $289.60 on Dec. 30, 1999. Gold probably will extend gains for a 10th year on concern that inflation will pick up and weaken the dollar, according to this year’s most-accurate forecaster. “As long as we see a zero-interest-rate policy in the U.S. and the probability of continued big fiscal deficit, the dollar is going to be under pressure again,” said Philip Klapwijk, the chairman of GFMS Ltd., a London-based research company. Klapwijk in January predicted spot gold in London would average $970 an ounce this year. It has averaged $973.09. Also in New York, silver for March delivery slid 45 cents, or 2.6 percent, to $17.11 an ounce. The metal, up 51 percent in 2009, has more than doubled from $5.453 on Dec. 30, 1999. April platinum fell $13.70, or 0.9 percent, to $1,476 an ounce. The most-active contract is up 57 percent this year and has tripled from its Dec. 30, 1999, price of $422.20. March palladium was unchanged at $388.85 an ounce. The most-active contract has doubled this year and fallen 13 percent from $449.20 at the close of 1999. Dec. 30 (Bloomberg) -- The dollar traded near a two-month high against the yen on speculation the Federal Reserve will withdraw stimulus measures as the economy recovers. The dollar may gain against the euro for a third day before a report economists said will show U.S. manufacturing expanded in December for a fifth month, adding to signs the economy is gaining momentum. The yen may extend losses against its major counterparts on prospects Japan’s struggling economy will make the Bank of Japan the last central bank to raise interest rates. The dollar bought 91.95 yen at 8:18 a.m. in Tokyo from 92.00 in New York yesterday, when it touched 92.08, the highest level since Oct. 27. The dollar traded at $1.4356 versus the euro from $1.4354. The euro was at 132 yen from 132.05 yen. The dollar has appreciated 4.5 percent versus the euro this month, trimming its 2009 decline to 2.7 percent. The greenback has fallen 30 percent against the euro this decade. The Institute for Supply Management’s U.S. manufacturing index gained to 54.0 in December from 53.6 in November, according to the median estimate of economists in a Bloomberg News survey before the Tempe, Arizona-based Institute for Supply Management reports the data on Jan. 4. Readings above 50 signal expansion. Adding to economic recovery signs, the Conference Board’s confidence index increased this month to 52.9 from 50.6 in November, the New York-based research group said yesterday. An S&P/Case-Shiller report showed home prices climbed in October for a fifth month. Demand for the yen also weakened as the yield premium offered by 10-year Treasury notes over similar-maturity Japanese bonds was 2.49 percentage points yesterday. It reached 2.53 percentage points on Dec. 24, the highest level since December 2007 based on closing prices. The wider the difference, the less appealing Japan’s debt is compared with U.S. securities. Futures trading in Chicago showed a 60 percent chance that the Fed will raise its zero to 0.25 percent target lending rate by at least a quarter-percentage point by its June meeting, up from 48 percent odds a week ago. FKLI Dec Futures contract traded 4 point higher to close at 1278 levels as compare to previous trading session to with a total of 4,309 lots traded in the market. FKLI search for low before and after traded higher during trading sessions as regional indices and Dow Jones futures electronic trading were traded sideways while waiting new leads for direction. FKLI continue to trade higher after manage to overcome previous resistance levels at 1273.5 and head next resistance levels at 1278.5 regions; 123.6% and 178.6% Fibonacci projection levels in the hourly chart. Technically, FKLI still haven’t shows any sign of reversal towards south provided support levels at 1269.5 and 1256 were not violated during trading sessions. Violation of support levels shall indicate bearish signal for medium term trading. Resistance levels were seen at 1281.5 and 1294 regions. CPO 3rd month Mac futures contract traded RM2 points lower as compare to previous trading sessions to close at RM2590 with a total of 4,909 lots traded in the market. CPO price opened higher due to strong soybean oil overnight trading but settled marginally lower due to some profit taking activity. CPO price false break above previous high at RM2628 but lose strength after fail to penetrate resistance trend line in the hourly price chart. Technically, CPO price seems trading within a broadening resistance and support trend line in the hourly price chart. CPO price starts plunge lower after manage to rebound 61.8% Fibonacci resistance levels at RM2620 regions. CPO price seems undergo some complex correction phase provided resistance levels at RM2628 and RM2658 were penetrate in the coming trading sessions in order for the bull rally to resume. 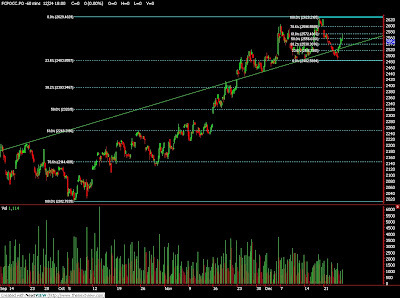 Short term support levels seen at RM2557 and RM2482 regions. Dec. 28 (Bloomberg) -- Crude oil rose to a one-month high as U.S. retail sales climbed over the holiday season and China said its economy grew faster than estimated this year, signs the worst global recession since World War II is abating. Oil increased for a fourth day as holiday spending gained 3.6 percent from a year earlier, according to an estimate by MasterCard Advisors’ SpendingPulse. China’s expansion will be more than 8 percent in 2009, according to government officials. Crude oil for February delivery rose 72 cents, or 0.9 percent, to $78.77 a barrel on the New York Mercantile Exchange, the highest close since Nov. 18. The U.S. economy next year will turn in its best performance since 2004 as spending picks up and companies increase investment and hiring, said Dean Maki, the most accurate forecaster in a Bloomberg News survey. The world’s largest economy will expand 3.5 percent in 2010, said Maki, the chief U.S. economist at Barclays Capital Inc. in New York. The number of Americans filing claims for unemployment benefits last week declined to the lowest level since September 2008, the Labor Department said Dec. 24. Initial jobless claims fell by 28,000, more than forecast, to 452,000 in the week ended Dec. 19. The U.S. is the world’s biggest energy user. The U.S. and the European Union today condemned Iran’s harshest crackdown on opposition protests in six months after at least eight people were killed in clashes with security forces. The U.S. government has threatened to impose sanctions after a Dec. 31 deadline unless Iran responds to diplomatic efforts aimed at allaying suspicions it is developing nuclear weapons. Iran will have the technology to build a nuclear weapon by early 2010, Israeli Defense Minister Ehud Barak told a parliamentary committee today, according to an official who spoke on condition of anonymity because the meeting was held behind closed doors. Iran is the second-largest oil producer in the Organization of Petroleum Exporting Countries, after Saudi Arabia. Brent crude for February settlement rose $1.01, or 1.3 percent, to $77.32 a barrel on the ICE Futures Europe exchange in London. Russia warned the European Union that it may cut off oil supplies to Slovakia, Hungary and the Czech Republic because of a dispute over transits, the Slovak government said today. At least 20 European countries suffered disruption of Russian natural-gas imports in January as the world’s largest producer of the fuel cut supplies to Ukraine during a payment dispute. Russian oil exports to Europe were interrupted in January 2007 when Belarus sought to tax transits. Oil prices have gained 77 percent this year and are poised for their best annual performance in a decade as the accelerating economy raises energy demand. The International Energy Agency increased its forecast for 2010 global oil consumption to 86.3 million barrels a day on Dec. 11, 130,000 barrels a day more than its previous estimate. “We could trade anywhere in the $80-to-$85 range by Thursday, which will set the tone for the first two weeks of the year,” said Stephen Schork, president of consultant Schork Group Inc. in Villanova, Pennsylvania. Crude prices are testing the upper end of a trading range between the high $60s and low $80s, in place since the end of July, he said. Cold weather will raise U.S. consumption of heating fuels by 6.7 percent in the next seven days, according to forecasts from Weather Derivatives. The temperature in New York may fall as low as 20 degrees Fahrenheit (minus 7 Celsius) tomorrow, 5 degrees below average, according to Weather.com. Heating oil for January delivery climbed 3.79 cents, or 1.9 percent, to $2.0735 a gallon on the Nymex, the highest since Dec. 1. U.S. inventories of distillate fuel, including heating oil and diesel, probably dropped 2.25 million barrels last week from a five-month low of 161.3 million barrels the week before, according to the median of nine estimates by analysts before the Energy Department report this week. Eight respondents forecast a decrease and one said there was a gain. Oil inventories probably fell 2.2 million barrels from 327.5 million the prior week, according to the survey. Seven respondents forecast a decline, and two said there was an increase. Oil volume in electronic trading on the Nymex was 162,958 contracts as of 2:51 p.m. in New York. Volume totaled 169,527 contracts Dec. 24, 71 percent below the average of the past three months. Open interest was 1.2 million contracts. Dec. 28 (Bloomberg) -- Gold rose in New York for the third straight session on speculation that the dollar will extend a slump, boosting demand for the metal as an alternative asset. The dollar pared gains of as much as 0.4 percent against the euro after declining 1.1 percent in the previous three sessions. Gold has climbed 25 percent in 2009, heading for the ninth straight annual gain, while the dollar slid 2.9 percent. Gold futures for February delivery rose $3.10, or 0.3 percent, to $1,107.90 an ounce on the Comex division of the New York Mercantile Exchange. The price climbed 1.7 percent in the previous two sessions. Gains were limited as some investors booked profits after the most-active contract rose to a record $1,227.50 on Dec. 3. Earlier, the price fell as much as 0.2 percent. “Some of the larger buyers have bailed on gold and, until the big money comes back on the buy side, gold is going to struggle,” said Matt Zeman, a LaSalle Futures Group trader. In London, gold for immediate delivery fell 65 cents to $1,104.80 an ounce at 7:24 p.m. local time. Among other precious metals traded in New York, platinum jumped to a three-week high as rising auto sales helped boost demand for the metal used in pollution-control devices in cars. Toyota Motor Corp., Japan’s largest automaker, led the first gain in domestic production in 14 months by the nation’s 12 vehicle producers as government incentives spurred demand. Platinum futures for April delivery climbed $15.70, or 1.1 percent, to $1,489.70 an ounce on the Nymex. Earlier, the most-active contract reached $1,498.80, the highest price since Dec. 3. March palladium, also used in car parts, fell 80 cents, or 0.2 percent, to $388.85 an ounce. Silver futures for March delivery rose 12 cents, or 0.7 percent, to $17.56 an ounce. The metal is up 55 percent in 2009. Dec. 29 (Bloomberg) -- The dollar traded near a two-month high against the yen on speculation the Federal Reserve may end emergency stimulus measures as the economy recovers. The U.S. currency was set to gain versus the euro for a second day before a report that economists said will show consumer confidence rose this month. The yen may extend its losses against most of its 16 major counterparts on prospects the Bank of Japan will be the last major central bank to start raising interest rates. The dollar bought 91.68 yen at 8:42 a.m. in Tokyo from 91.63 in New York yesterday. The U.S. currency rose to 91.87 on Dec. 22, the strongest level since Oct. 27. The dollar traded at $1.4374 per euro from $1.4378 yesterday. The euro fetched 131.74 yen from 131.76 yen. The New York-based Conference Board’s consumer confidence index probably rose to 53 this month from 49.5 in November, according to the median estimate of economists in a Bloomberg News survey showed. Property values in 20 metropolitan areas in the U.S. probably fell 7.2 percent in October from a year earlier, the smallest drop since 2007, according to the median forecast in a separate Bloomberg survey before a report today from S&P/Case- Shiller. Futures trading in Chicago showed yesterday a 60 percent chance that the Fed will raise its target lending rate by at least a quarter-percentage point by its June meeting, up from 46 percent odds a week ago. The Fed proposed a program to sell term deposits to banks to help mop up some of the $1 trillion in excess reserves in the U.S. banking system. The proposal, subject to a 30-day comment period, “has no implications for monetary policy decisions in the near term,” the central bank said in a statement. Ten-year U.S. yields reached 3.85 percent yesterday, the highest level since Aug. 10. The Treasury’s sale of $44 billion in two-year notes yesterday drew a yield of 1.089 percent, the highest level since August. The yield premium of 10-year notes over similar-maturity Japanese bonds reached 2.53 percentage points on Dec. 24, the highest level in two years, increasing returns on dollar- denominated assets. The gap held near that level yesterday. 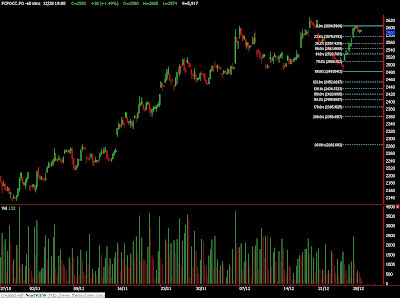 FKLI Dec Futures contract traded 10 point higher to close at 1274 levels as compare to previous trading session to with a total of 6,920 lots traded in the market. FKLI was traded higher during trading sessions as regional indices; Nikkei index and Hang Seng Index were traded firm while Dow Jones was settle higher before close for holiday. FKLI manage to penetrate previous resistance levels at 1270 regions and traded holding about 1270 regions during trading sessions. Technically, FKLI closed at 100% and 123.6% Fibonacci projection levels at 1274 regions where 61.8% Fibonacci resistance levels seen at 1273. FKLI would still consider riding on uptrend provided support levels at 1269.5 and 1256 must not be violated during trading session. 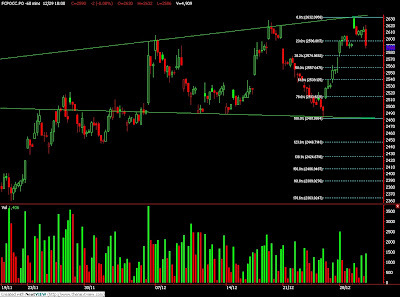 FKLI would expect great selling activities around 1278.5 and 1285 resistance levels. CPO 3rd month Mac futures contract traded RM38 points higher as compare to previous trading sessions to close at RM2592 with a total of 5,917 lots traded in the market. CPO price was traded higher during trading session despite ITS and SGS export report shows significant drop on the export volume as compare to same period of last month. CPO price continue to rebound higher during trading session and manage to reach same level of high as compare previous 2nd highest levels at RM2605 regions after manage to penetrate shortly above 78.6% Fibonacci resistance levels at RM2598 regions to cover the previous gap regions. Technically, CPO price seems form a head and shoulder formation in the hourly price chart provided resistance levels at RM2606 and RM2628 were not violated in the coming trading sessions. 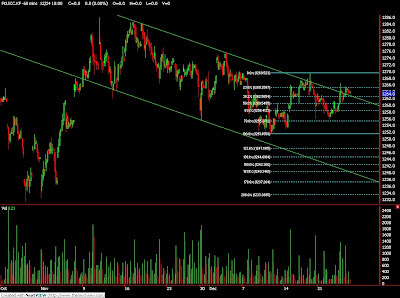 Buying interest would be expect to anticipate around support levels at RM2558 and RM2529 regions. MUMBAI, Dec 28 (Reuters) - India's soybean futures rose in early trade on Monday tracking Malaysian palm and on lower output estimate, but weak soymeal exports weighed on sentiment, analysts said. At 11:40 a.m., the January soybean NSBF0 on the National Commodity and Derivatives Exchange was up 0.63 percent at 2,407 rupees per 100 kg. India's oilmeal exports halved to 346,859 tonnes in November, its first monthly fall in three months, as soymeal prices rose following a poor oilseed crop and as shipments to Vietnam, Japan and China fell. Dec. 28 (Bloomberg) -- Crude oil traded above $78 a barrel in New York after rising to a three-week high on signs that the U.S. economy is recovering. Oil climbed to $78.05 a barrel on Dec. 24, the highest settlement since Dec. 1, as initial U.S. jobless claims dropped more than expected and orders for durable goods excluding transportation equipment beat economists’ forecasts. The U.S. dollar rose against 13 of its 16 major counterparts. Crude oil for February delivery was at $78.21, up 16 cents, in electronic trading on the New York Mercantile Exchange at 11:40 a.m. Sydney time. Oil has gained 75 percent this year. The dollar advanced to $1.4374 per euro today from $1.4411 in New York on Dec. 25. A stronger dollar limits the appeal of commodities as an alternative investment. The decline in U.S. homes prices likely eased further, economists said. Property values in 20 U.S. metropolitan areas probably fell 7.1 percent in October from a year earlier, the smallest 12-month drop since 2007, according to a median forecast of 29 economists surveyed by Bloomberg News before a Dec. 29 report from S&P/Case-Shiller. Dec. 28 (Bloomberg) -- The dollar gained for the first time in four days against the euro and yen on speculation U.S. companies are bringing back earnings on overseas assets before the end of the year. The greenback also strengthened on prospects U.S. reports tomorrow will show the world’s largest economy is recovering, backing the case for the Federal Reserve to withdraw emergency stimulus measures. The yen fell against all of its 16 major counterparts after Japanese Prime Minister Yukio Hatoyama unveiled a record budget of 92.3 trillion yen ($1 trillion). The dollar rose to $1.4375 per euro as of 10:46 a.m. in Tokyo from $1.4411 in New York on Dec. 25. The U.S. currency advanced to 91.56 yen from 91.11 yen. The euro traded at 131.61 yen from 131.64 yen. Property values in 20 metropolitan areas in the U.S. probably fell 7.1 percent in October from a year earlier, the smallest 12-month drop since 2007, according to a Bloomberg News survey of economists before a Dec. 29 report from S&P/Case- Shiller. The New York-based Conference Board’s consumer confidence index may rise to 53 in December from 49.5 in November, a separate Bloomberg survey showed before the report is released on the same day. Futures on the Chicago Board of Trade showed a 55 percent chance on Dec. 25 the Fed will raise its target lending rate by at least a quarter-percentage point by its June meeting, up from 48 percent a day earlier. The central bank next meets to review borrowing costs on Jan. 28, 2010. The greenback may extend gains versus the yen on speculation that rising U.S. debt yields will increase returns on dollar-denominated assets. Ten-year yields were at the highest level in more than four months before the Treasury sells $44 billion in two-year notes today in the first of three auctions this week totaling a record-tying $118 billion. The yield on the benchmark 10-year note rose one basis point, or 0.01 percentage point, to 3.81 percent, according to BGCantor Market Data. That’s the highest level since Aug. 10. The Dollar Index, which IntercontinentalExchange Inc. uses to track the dollar against the currencies of six major U.S. trading partners, was little changed at 77.770. Against the yen, the dollar reached 92.32 on Oct. 27, the highest level since Sept. 21. Japan’s currency weakened after Hatoyama’s proposal for the fiscal year that starts April 1, released last week in Tokyo, said the government will sell 44.3 trillion yen of new debt to help fund a revenue shortfall. Hatoyama’s Cabinet has an approval rating of 50 percent, down 18 percentage points, according to a Nikkei Inc. and TV Tokyo Corp. survey. The disapproval rating rose 18 points to 42 percent from the November survey. Hatoyama’s budget, the first since his Democratic Party of Japan took office in September, reflects campaign promises to address economic stagnation by lifting the spending power of the nation’s households. 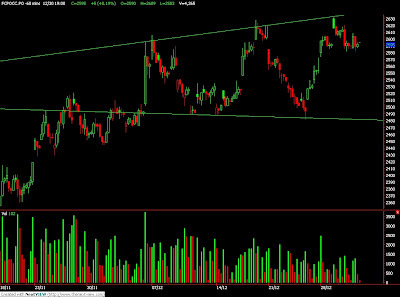 FKLI Dec Futures contract traded 0.5 point higher to close at 1264 levels as compare to previous trading session to with a total of 4,101 lots traded in the market. FKLI was traded sideways in the 2nd trading session as most of the regional indices were closed for trading due to Christmas Eve which directly affects FKLI trading directions. FKLI manage to rebound to test resistance levels at 1265.5; 78.6% Fibonacci resistance levels after opening for trading at 1260 regions. 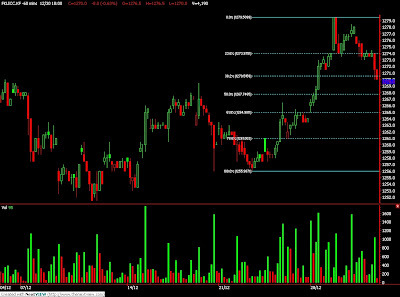 Technically, FKLI still unsure of the trading direction as price was trade within range from 1256 to 1267 regions; both were 78.6% Fibonacci support and resistance level in the hourly chart. FKLI temporary sideways trading unless traded price manage to trade beyond support levels at 1260 and 1251.5 while resistance levels were seen at 1270 and 1281.5 regions. CPO 3rd month Mac futures contract traded RM50 points higher as compare to previous trading sessions to close at RM2554 with a total of 4,306 lots traded in the market. CPO price manage to rebound higher as crude oil and soybean oil were traded firm during overnight and electronic trading despite CPO price encounter great profit taking activities during previous trading sessions. CPO price rebound fiercely after were traded lower in the 3 consecutive days in the past trading session. Technically, CPO price seems manage to rebound 61.8% Fibonacci resistance levels at RM2572 regions before encounter some great selling pressure which subsequently form a long headed Doji in the hourly price chart. 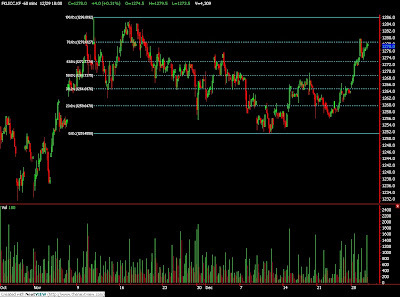 Based on Fibonacci calculation, CPO would encounter great selling pressure around 61.8% and 78.6% Fibonacci resistance levels at RM2572 and RM2600 regions where there is a gap seen in the hourly and daily chart. Uptrend would resume provided traded price must be able to penetrate above resistance levels at RM2600 and RM2628 regions while support levels at RM2482 and RM2393 are able to hold against the selling pressure.